“I wasn’t the kind of kid who grew up playing in the dirt or even who had a big interest in insects per se,” said Noah Wilson-Rich. But one biology professor in college, Northeastern’s Rebeca Rosengaus, introduced him to “the amazing world of social animals.” After graduation, the former pre-med student found himself pursuing a PhD in biology instead, studying bees. His idea was novel — “selling beehives to raise funding for my research,” simply put — and it has been a success. A business begun in his South End apartment, a decade later Best Bees is valued at half a million dollars, with 17 employees. 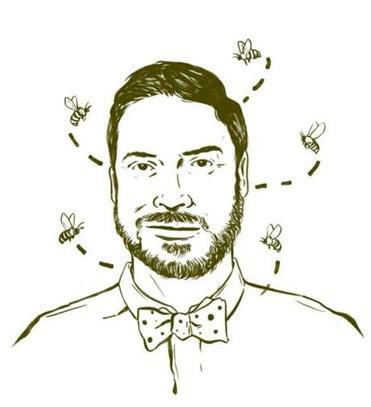 Like backyard chickens, urban beekeeping has a certain of-the-moment cachet, but Wilson-Rich, who teaches biology at Northeastern, says it’s no fad. “The function behind it is undeniable,” he said, adding that as pollinators of more than 100 different fruit and vegetable crops, bees help power the US economy. Wilson-Rich reads Tuesday at 6 p.m. in the Commonwealth Salon, Boston Public Library, 700 Boylston St.